I was sitting in the waiting area of the local tire shop yesterday, and they had a TV going. For entertainment, I guess. Usually, it is tuned to a "news" network where you can watch people angrily disagreeing over politics. This time it was tuned to some sports network and there on the screen were people angrily disagreeing over sports. Or, is it all an act? I can't tell. My first thought was that people surely couldn't care that much about sportsballing. They had to be putting on an act in order to excite and divide their large studio audience (unless the audience was CGI). Are they trying hard to create drama where none would otherwise exist? 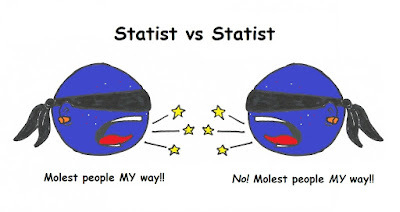 Then I realized I usually feel the same when I see two extreme statists angrily disagreeing over how you and I should "best" and "properly" be violated by government. 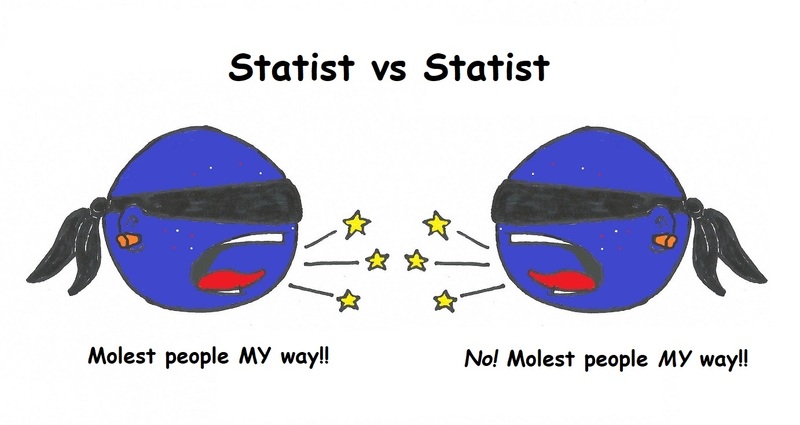 They are on the same side; taking the side of government against liberty. Are they really so blind they can't see that? Or are they putting on an act in order to excite and divide their audience? To create drama where none would otherwise exist?